TPI Whole Egg Powder is free-flowing, light yellow in color and provides the same protein as fresh eggs but at a much lower cost! It can be used as a protein supplement or as an egg replacement in recipes. Whole Egg Powder ranks among the highest quality protein foods because it provides each of the amino acids your body needs to function properly. Whole Egg Powder is a nutritious source of protein for vegetarians because it's a non-meat option that is a complete protein. Because it keeps for long periods of time but retains the same nutrients that are found in fresh eggs, Whole Egg Powder is convenient for preparing any egg-containing recipe. Egg ingredients provide a high level of essential amino acids. The availability & digestibility are important factors for people who depend on a protein boost to sustain muscle function. Another advantage is seen when consumers decrease carbohydrate consumption & raise the level of high- quality protein intake. Findings show hunger pangs are reduced because egg protein metabolizes slower & maintains consistent blood levels. 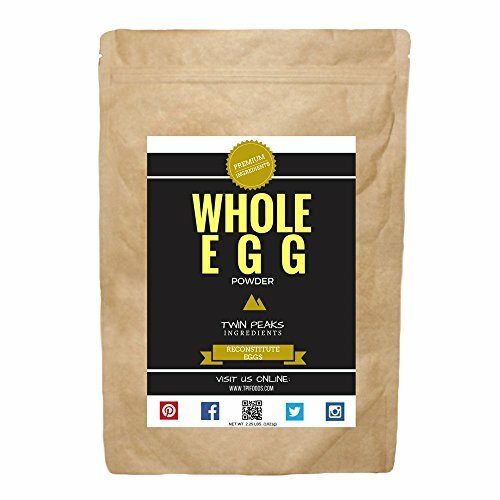 Why are scrambled eggs made with TPI Whole Egg Powder so good? Because they are REAL EGGS-- just dried! If you have any questions about this product by Twin Peaks Ingredients (TPI), contact us by completing and submitting the form below. If you are looking for a specif part number, please include it with your message.